This episode is a little different. 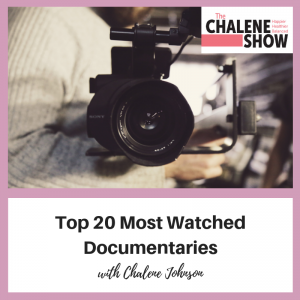 But due to many requests, Chalene shares her top 20 must watch documentaries. This is Chalene’s favorite way to bond with her husband and kids as a family… by watching documentaries and absorbing new knowledge and perspectives on the real world. You may just have to create a documentary bucket list for 2019 with all of these favorites Chalene shares. If you liked this episode and you want me to do this once every 6 months or once every year… send me a message through SpeakPipe and let me know what you think!